I wanted to share with you some reader and viewer comments to my First Look at Total Wireless video. Several of you have been kind enough to leave comments and share your experience from Total Wireless. First, on smartphonemattters.com, a reader Jason, shares that he and his wife signed up for the $60 shared plan. He was excited to find Total Wireless, he was considering Straight Talk, but with Total Wireless opted to save $30 a month on the two lines. They are using the iPhone 6s and iPhone 6 and he says his download speeds is about 5Mbps. Back over on YouTube, MrJopn83, Carlos, and Matthew have all left comments. The consensus seems to be that the maximum download speed is about 5Mbps and that once you use up your data, it shuts off until you either buy more or your plan renews. Carlos and MrJopn83 disagree on whether or not you can add data the the $25 talk and text plan. MrJopn83 says he is using this plan with his Nexus 5x while Carlos says the you can’t because the $25 plan is for basic phones. MrJopn says he is using the service while Carlos is considering it. Finally, MrJopn shares an interesting tip. He says he signed up using a Tracfone Verizon network SIM he bought from BestBuy for $1. I haven’t tried this myself, but Total Wireless is owned by Tracfone so it could work. I am not sure when I’ll get to trying out total wireless, but I though I’d share with you what others were saying. A number of smartphonematters.com readers have asked me if I have tried Total Wireless yet and while I have not had a chance to review it yet I thought I’d take a look to see what they have to offer. 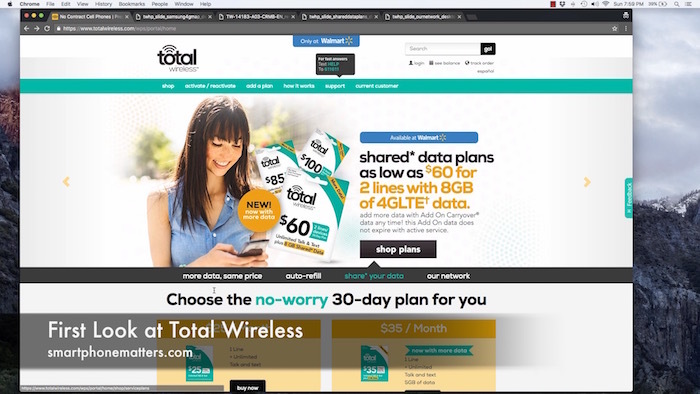 Taking a look at totalwireless.com, we see they have a $35 unlimited talk and text plan that included 5GB of 4G LTE data and you can add data at any time. It also says that 4G LTE is now available and that they use America’s largest and most reliable network. We can also see that is save Total Wireless is available at Walmart and Only at Walmart. So far this looks really good, the $35 per month is a great price for an unlimited plan with 5GB of 4G LTE data. Being able to add more data when you need it is also really attractive. Looking at the red coverage map, I can tell that Total Wireless is using the Verizon network. Finally we can see that Total Wireless is a trademark of Tracfone Wireless and the brand is exclusive to Walmart just like Straight Talk Wireless which is also a Tracfone brand and exclusive to Walmart. Next they advertise that you’ll save 5% on your monthly plan when you sign up for AutoRefill. When you sign up for Auto Refill, you let Total Wireless charge your credit card each month automatically.You’ll receive the 5% discount in exchange for letting Total Wireless automatically bill you. Next you’ll see they highlight that they have shared data plans. For $60 a month, you’ll get 2 lines with unlimited talk and text with that share 8 GB of 4G LTE data. They also state that you can buy Add On Carry Over Data that doesn’t expire as long as you have active service. This averages out to $30 per line with 4GB each if you split the data equally. Finally, the tout the best coverage and show their coverage map. While they do not explicitly say they use the Verizon network, the red map is clearly Verizon’s coverage map. Total Wireless has a nice clearly laid out table describing the different plans and details. Right away you can see they have both individual and shared plans. They have a $25 plan with unlimited talk and text but no data. They also have the $35 plan with unlimited talk and text with 5GB of 4G LTE data. The table also shows the plan cost with the 5% auto-refill discount. Total Wireless also has shared data plans. All lines include unlimited talk and text. The $60 plan includes 2 lines and 8 GB of 4G LTE shared data. The $85 plan included 3 lines and 12 GB of data. Finally, the $100 plan includes 3 lines and 15GB of data. You can also purchase 3GB of Add-On Carry Over Data for $10. This data does not expire as long as your account remains active. That is impressive. Finally, it looks like they have a $10 Global calling option. You’ll be able to call landlines and mobile phones in a number of countries for between 2 and 5 cents per minute. It looks as though you cannot dial international numbers directly. Instead, you’ll have to dial an access number like you were using a phone card. Total Wireless also has a Bring Your Own Phone plan. You’ll need to enter your zip code and your phone’s serial number of MEID number to check if your phone is compatible. Because Total Wireless uses the Verizon network, they need to check that number to see if Verizon will let them register it for use on the network. I do have a few questions about Total Wireless I need to answer. First, I’d like to know if I could use the Add-On Carry Over data with the $25 plan that doesn’t include any data. I didn’t find any info about this on totalwireless.com. I suspect the answer is no, that you can’t add add-on data to a plan that doesn’t include data. It would be awesome if you could though. Second, I’d like to know what happens after you use up your 4G LTE data. Does your data just stop working until your next refill or do you get really slow 2G data speeds similar to what Straight Talk and Verizon prepaid offer. Finally, I’d like to know if the speed of Total Wireless’s 4G LTE data is restricted to 5Mbps down like we see on Straight Talk’s Verizon network. I suspect it is, as I have been told that it’s Verizon that imposes that restriction on the wireless prepaid companies that use their network. So far, I’d have to say Total Wireless looks impressive if you want to use the Verizon network. I like the price, shared data, and add-on carry over data options. What about you? Are you interested in Total Wireless? Want to see me do a review? Leave a reply below and share. I had the $25 card and did add the $10, 3 g card and it did work fine. Did you buy your phone from total wireless or did you Bring Your Own Phone? Got it up and running and it was capped at 5. Thanks for your article I didn’t even now it existed was looking at straight talk but since we have two phones the shared data plan for 60 is awesome saving big $$$ using this. So far I’m very happy with total wireless using our iPhone 6 and iPhone 6s. Glad it hear you are now saving some money. Thanks for taking the time to share you experience.